Candidates who are hunting over the internet about the APTRANSCO AE Syllabus 2019 can look at this article to grab lot more material. It is compulsory for all the contestants to note down the subject wise topics to make your preparation precise. If the candidates prepare according to the APTRANSCO AE Exam Syllabus for the applied Assistant Engineer (AE) posts, they can face the concerned Andhra Pradesh Transmission Corporation Limited (APTRANSCO) Written Exam more comfortably. 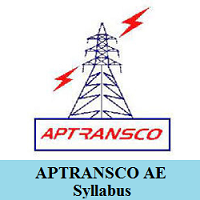 Moreover, the applicants should take the topics from the given Andhra Pradesh TRANSCO AE Syllabus 2019 PDF to revise all the topics. Also the officials of the Andhra Pradesh Transmission Corporation Limited (APTRANSCO) had announced the exam date that is on 30th April 2019. In this single article, we have also included the subject wise topics for the Andhra Pradesh TRANSCO AE Syllabus & APTRANSCO Exam Pattern. To the end of this article, we have also attached you with the relevant link to download the APTRANSCO AE Syllabus 2019. Candidates must and should refer this section to know the latest aptransco.gov.in AE Selection Process 2019. And there are two rounds which are given as below. Candidates can directly start the preparation for the APTRANSCO Written Exam only after referring to the ఆంధ్రప్రదేశ్ ట్రాన్స్మిషన్ కార్పొరేషన్ లిమిటెడ్ Assistant Engineer Test Pattern 2019. Else more, the candidates can get the name of the subjects, total marks allotted for the examination. Check the below table for the appropriate subjects assigned for each post. Moreover, you should complete the test within the given time duration. So, you should know the APTRANSCO Exam Pattern so that you can complete and also can revise your responses in the test. The exam will be conducted in the multiple-choice type. So, you can quickly solve and choose your answers. Besides downloading the PDF, you must once look at the below-listed topics that are to be covered before the Assistant Engineer Examination. At the end of this page, we have inserted the appropriate link to download the APTRANSCO AE Exam Syllabus 2019 PDF. Consequently, writing down the topics for the stipulated subjects enhances your performance level in the APTRANSCO AE Written Exam. Candidates who get shortlisted in the written test will have the chance to enter into the selection process. Instantly, note down the below-listed topics for each subject required for the test. Note the following topics required to prepare for the AE Written Examination. Follow us on FreshersNow.Com for the more information about the APTRANSCO AE Syllabus 2019.